I am using macOS Mojave on a MacBook Pro. I don't know if it's just me, but I feel like the mouse pointer, from time to time, seems to stick to the edge of the monitor when I try to move it from secondary monitor to the primary monitor (the secondary monitor is to the right, primary (laptop built in monitor) to the left). If I try to make it happen on purpose it never happens, which makes me feel like I was mistaken in the beginning, but after playing around for a while I feel like it definitely is happening, but only sometimes and I'm not sure why. Does this annoying snap-to-monitor-edge feature have a name, and more importantly how do I disable it? 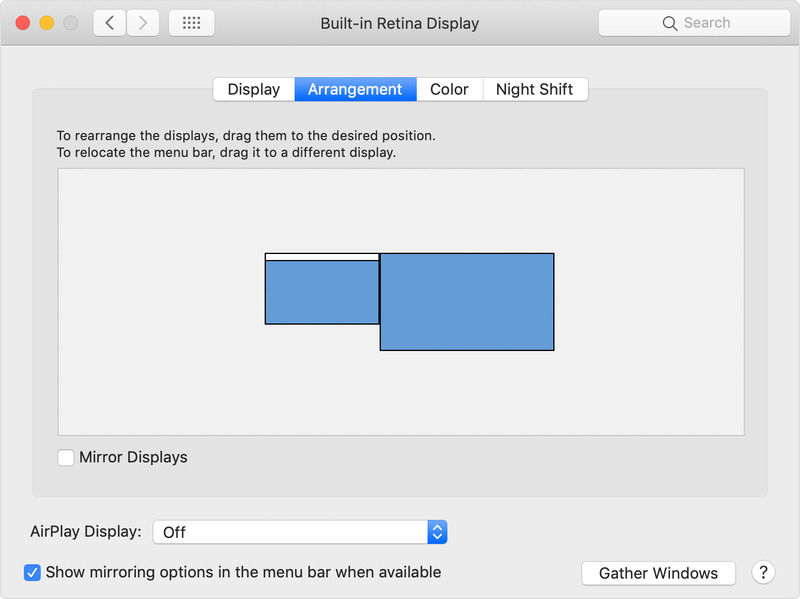 The display on the left is your built-in display, while the one on your right is the external, extended display. Now, notice the horizontal alignment of the displays. When moving the mouse from external to built-in display, if you are moving the mouse along the bottom edge, the pointer will have no path to move into the built-in display shown on left, as it hits the edge of the external display. If you move the mouse pointer vertically to appropriate height, the mouse pointer will find a way to move into built-in display as soon as it reaches the corner of the built-in display. You can try this by dragging the mouse pointer along the edge of external display vertically, while attempting to move the mouse pointer towards left. Refer to the Apple Support document, Use external monitors with your Mac for more details. Not the answer you're looking for? Browse other questions tagged macbook display mouse dual-screen . How to disable mouse acceleration in Yosemite?